1. Every beekeeper has their way of doing things and according to every beekeeper, their way is right. In the end, do what works for you. Manage your bees so that you enjoy it. Beekeeping should be fun. Not depressing! 2. Buy 2 hives to start. If one hive dies, at least you still have one more and won't have to start all over again next year. If one hive is stronger than the other, rob from the stronger to feed the weaker and even everyone out. 3. No matter what you do sometimes a beehive will die. Use this opportunity to be a detective and learn from your mistakes so that you can avoid them in the future. 5. Never stand in front of your hive. Pay attention not to cast your shadow on the front door of the hive. Remember, bees use the sun to orient and if you're blocking it with your big head it makes them mad. Speaking of making them mad, don't eat bananas before visiting your bees. You'll smell the same as their alarm pheromone which never works out well for you. And don't wear black. They'll think you're a bear and start attacking you and you'll get super hot in the summer sun. If you don't believe me, try it sometime. 6. When possible, catch swarms! They are free bees and are usually very docile! Plus it'll help add local genetics to your stock. If you do catch a swarm, keep them separated if possible from your other bees for a short period of time to make sure they are healthy. 7. Use local stock. Don't buy bees from halfway across the world. It may sound romantic to have bees all the way from Hawaii but the truth is, those bees have no idea what it's like in your region and as a result aren't going to know when to ramp up or slow down the population. Buy local bees and work towards someday raising your own queens using local genetics. 8. Get a notebook and call it your "Bee Journal" Bring this with you every time you visit the bee yard. 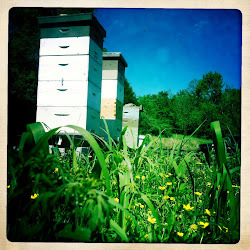 Establish a numbering system for every yard so that you can easily identify and write notes about each hive. When you're done with these notes at the end of the day think about entering them in online hive tracking software such as www.hivetracks.com or beetight.com. 9. Don't requeen your hives every year because you read it in a magazine or the queen breeder told you to. You don't go out and buy a new car every year just because it's a year old. Evaluate your queens every year. Which ones did well over the winter? Which ones have a great laying pattern? Some of my hives have done better in the 2nd or even 3rd years. If you keep starting over with a new queen every spring in my opinion you are essentially starting from scratch genetically. Did you know that almost all the queens produced commercially in the US come from roughly the same 500 queen mothers? Trouble is brewing....but that's another post. 10. An incredible beekeeper named Michael Bush says "if you don't know what to do with your bees, don't do anything. In the end, they will figure it out." Listen to your bees. Let them guide you. Every day I visit those tiny little insects they teach me something new. My hope is they do the same for you. Great post! My husband and I don't have bees now, but I grew up with them. I LOVED watching them. They are such interesting insects!! My family actually used to get out lawn chairs on nice evenings and sit and watch the bees. It sounds weird but it was really fun!! And if we hadn't done that, we never would have discovered that giant dragonflies were eating our poor bees on their way home each night.... Nasty things. This is obviously a late reply but I thought I would share something that would make you smile. I was walking out to check my on my bees and I saw a dragonfly fly by and was wondering if they eat the bees. Just as that thought crossed my mind a bee blasted by my head, caught the dragonfly out of the air and killed it. I had my answer in the most graphic way! Of course the bee dies as well but it was still amazing to watch. No kidding about the dragonfly! Isn't it amazing that a beautiful creature can be so tough on a bee?? Great advice! I've been doing it for two years and wish I'd known some of this when I started. Great post. I didn't know the one about my big 'ole head blocking the sun which can disorient the bees. I will be more mindful of that. I've been a bee keeper for 38 years and all I can say about the ten tips is AMEN. Where do raise bees? I am up in Timmins Ontario, Canada.